If you’re a firefighter, you need to stay in shape. That can be tough, though, especially when well-meaning citizens stop by with cakes, donuts, cookies, and other sweets. And the workout you need is not just any exercise, but it should be tailored to the kind of work you do. That’s what our guest on this episode advocates. 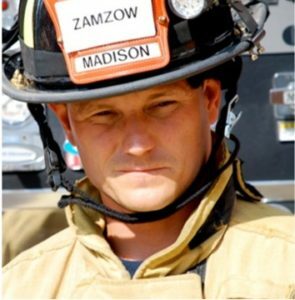 Aaron Zamzow is a firefighter and EMT in Madison, Wisconsin and is also a certified and degreed Personal Fitness Trainer and author. Aaron has also been working in the fitness industry as a Personal Trainer and author for 25 years, and has trained with elite athletes for the NBA, NHL, and NFL and has studied under some of the top trainers in the world.